A sumptuous treat for the eyes! 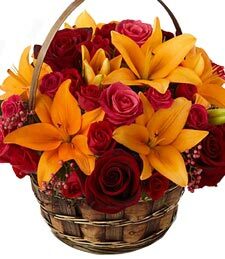 With glowing autumn-colored roses and lilies delightfully arranged in a basket with seasonal accents, this unique bouquet of fall flowers truly speaks volumes. Order a delivery from a talented florist today!